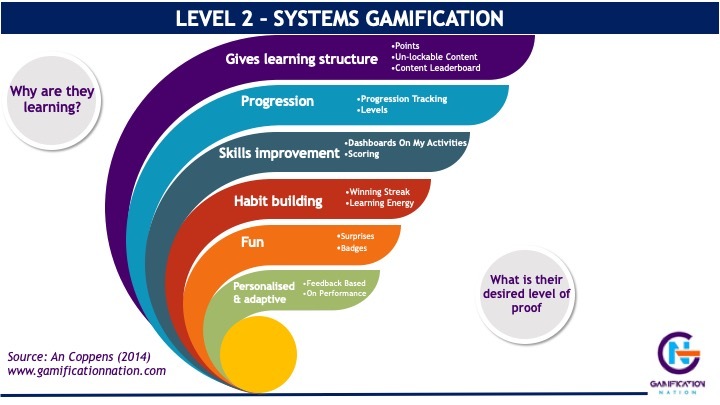 How can gamification be used to enhance e-learning? What are the other basics that need to be in place to make gamified e-learning work? The learning experience always starts by exploring what your learner already knows and where they may benefit from improving. Based on this starting point a learning designer would map out content and work with subject matter experts to generate an engaging learning design. The learning designer in tune with learning science will know when to create theory and when to build in practice. 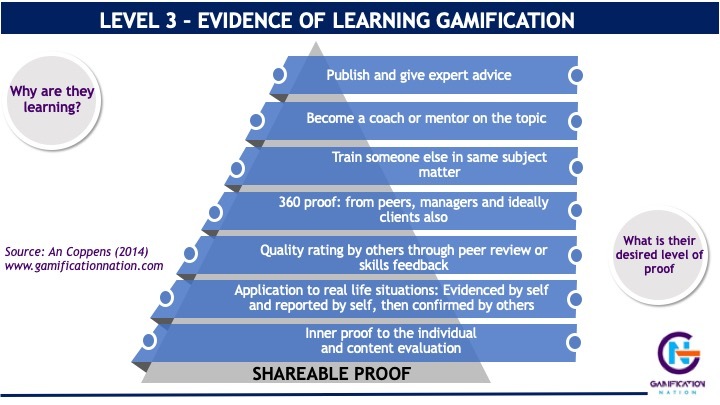 In order to create a gamified learning journey, you need to understand why the learner learns and what level of proof they want. When you know this, then you can start applying game psychology to encourage them to repeat steps and explore how their choices may result in outcomes that may be different from what they intended. Content gamification can make the content more interesting through the use of narrative, scenarios with choices and consequences, insights and feedback as you go. When you are then moulding the content into a learning module, the design and functionality become the next focus. Today’s learner is used to great user experiences from the apps they use for personal use. Anything less will drive them away and will basically make them go to social media or other online resources to learn about the content. User experience, graphics and ease of access are critical for your e-learning to succeed above and beyond gamification. In my Prove It framework for the gamification of learning, I include a number of elements that allow for first-person learning, which is a departure from passive click through e-learning where you are merely an onlooker. 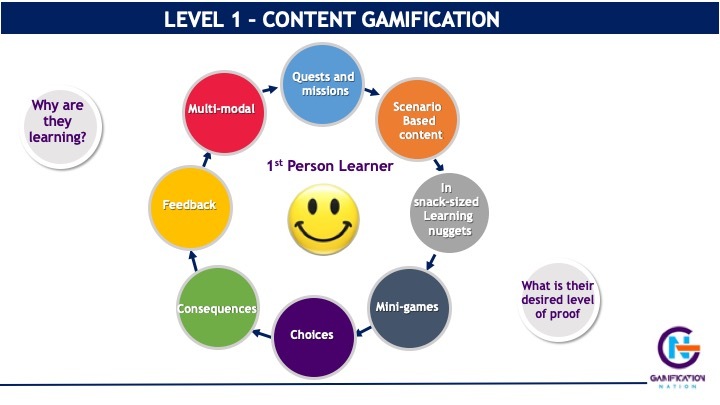 In games you are the active player, this should be the same when you apply gamification to e-learning. You may still have instruction happening, so one doesn’t rule out the other by default. When you are new to a subject, you may have the enthusiasm of a novice and look for anything and everything about that topic. Once you have reached some level of mastery, you may need nudges to revisit materials or to continue levelling up. It is here that systems gamification can help you forward. The underlying assumption here is that your e-learning also increases in difficulty to match the learner’s expansive mindset or it has a good reason for repetition to be critical. In the language learning app Duolingo repetition is seen as a good thing, to encourage this they have included login streaks for daily practice and energy levels to indicate when you last went through some vocabulary. Keeping the energy up is encouraged, just like keeping an unbroken streak. If you try to apply the same game mechanics to e-learning that requires less practice and where the learner really doesn’t see the point in it, is missing the core learning science behind it. In my learning gamification framework, I listed some of the learning reasons behind game mechanics which I see as essential to applying the right gamification mechanics in the right place for the end-user. Here are some of the gamification elements that may enhance the process of systems gamification. Normally I would expect to see them in your learning management system or learning experience system for best effects. How will you know they have learned? e-learning in most companies needs to deliver business results. A lot of learning teams are now working with business results in mind. When you have these the level of proof required from learning will also become easier to find. If these business intentions then match the personal intentions of the learner, you have a win/win learning scenario. If only it was that simple, I can hear some of you thinking. And yes, it is true that what organisations want their people to learn doesn’t always match what the individual wants to learn. Equally in some companies giving the business reasons for training is not yet standard practice and I would strongly suggest that you look for it regardless of whether it is given. Knowing the ‘why’ from both angles can help you create a way more meaningful and impactful learning experience. In my 3rd and final level of the Prove it! learning gamification model, I included some of the ways proof can be established. Also, know that some people actually don’t require proof they just want to know how to do something. For example, an accounting student may have forgotten how to add a particular formula to an excel sheet, so a quick answer or cheat sheet will do the trick. you don’t need them to take a whole e-learning module no matter how gamified it is. Some of the levels of proof in learning are what you would like to see from learning management or ticking boxes perspective. I would urge you to look at it from the learners’ point of view instead. Did they get what they came for? If yes, you have achieved the learning objectives from the learner. Learning outcomes on an organisational level may still be there and then become part of the larger performance question. Are your people buying into these outcomes? For best results, they at least should be willing to consider them as important enough to invest the time and effort. I hope we went some way in explaining how gamification can be used to enhance e-learning. In any case, we would love to talk to you further about your learning related gamification projects, you can contact us any time. Is mastery just a matter of hours spent at a topic? 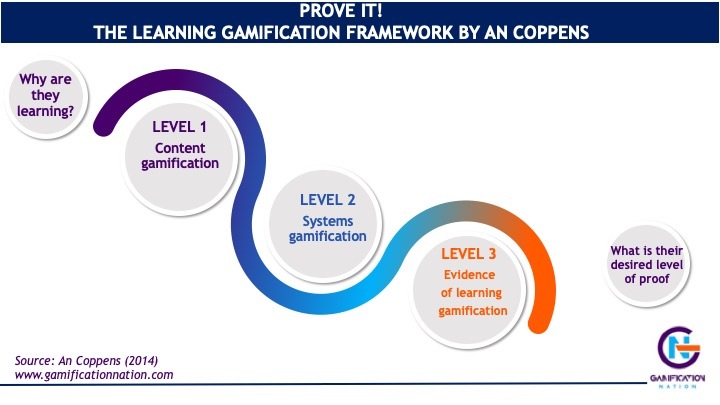 The post How can gamification be used to enhance e-learning? appeared first on Gamification Nation. Next Next post: What if social media allowed dislikes and peer ratings?